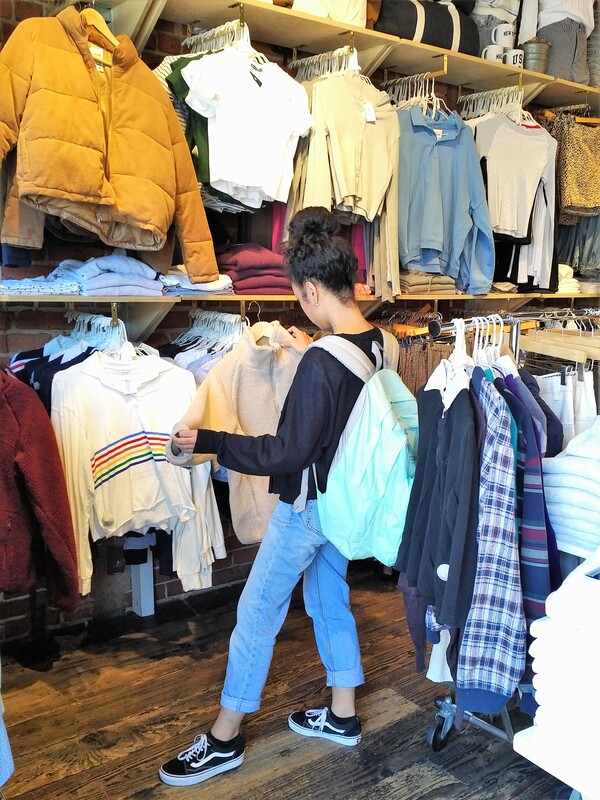 A shopper examines clothing in a Brandy Melville Store in Westwood. A chain clothing store, Brandy Melville, is the latest business that will open in Caruso’s Palisades Village. The store does not carry different sizes, but instead offers one-size-fits all clothing. According to LDNfashion, a fashion guide to London, the one-size is designed to fit a tiny UK size 4-6. Ethicaloo (a website devoted to discussing what brands are more sustainable) notes that Brandy Melville features trendy clothing styles aimed at teenage girls, with only a single small size available called one size. The store is the offspring of an Italian clothing company founded in 1970 by Silvio Marsan and his son Stefan. The first store opened in Westwood, near UCLA, in 2009. According to Wikipedia, there are now 65 stores, and the company places little emphasis on advertising, but instead relies on social media and word-of mouth. The brand has come under criticism because it is offered in only one size. This top is $20 in the United States. Prices in other countries are listed. In a June 2018 opinion piece in the San Jose Mercury News, titled “Brandy Melville’s ‘One-Size-Fits-Most’ Claim Is a Joke,” the author stated: “According to their website, their skirts are based on a waist measurement of 24 inches, and their pants can stretch up to a size 2. Considering the fact that the average American woman is a size 16, their one size certainly does not fit most. “This unreal expectation has caused teenage girls to feel insecure about their bodies. “’People see models that wear this type of clothing, and they feel like they need to have that type of body to be on trend,’ said Risa Mori, a senior at Lynbrook High School in San Jose. The clothing, which targets tweens and teens, is relatively inexpensive with the tops retailing at $16 to $32; the jeans are in the $40 price range and the dresses run $26 to $38. For those who don’t fit into the clothing there are reasonably priced accessories, such as backpacks, wallets, purses, jewelry, socks, scarves, belts, phone cases and hair accessories. The typical “Brandy girl” is Californian, blonde, thin and popular, according to LDNfashion. Brandy Melville clothes are primarily made in Italy with some manufacturing being outsourced to China.